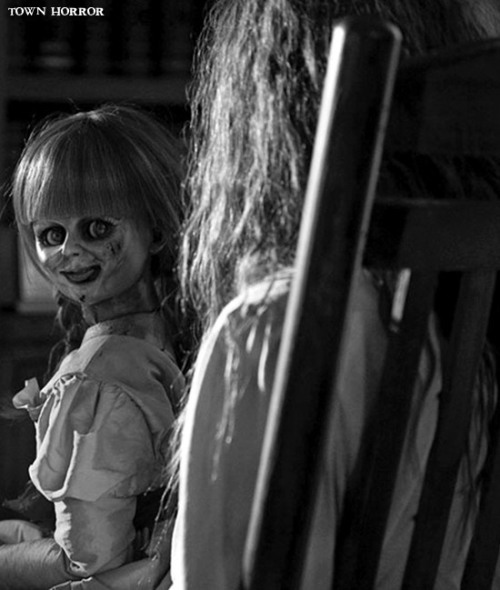 Supernatural horror is one of my favorite sub-genres, and I’d argue that James Wan’s The Conjuring is the best addition to this category in the last two decades – I mean, it’s Rated R just for scares alone (no gore, just lots of suspense and tension!) Ed and Lorraine Warren, real life paranormal experts previously best known for investigating the Amityville Horror House, finally have their incredible life stories put into the spotlight by the supremely talented Vera Farmigia and surprising horror regular, Patrick Wilson. Supporting actors Lili Taylor and Ron Livingston are excellent as the Perron’s, a husband and wife who move their entire family into a farmhouse with a gruesome past, and the movie clearly (and successfully) draws influence from retro horror gold like Poltergeist, The Amityville Horror, and the Exorcist. The real Annabelle doll was a Raggedy Ann doll. Please check out the Warren’s museum page for the true story, it’s awesome. Honestly, one of the scariest movies I’ve seen. When I saw this in theaters, there was more than one scene that made me jump. i now have a constant fear of hearing a clap while home alone.